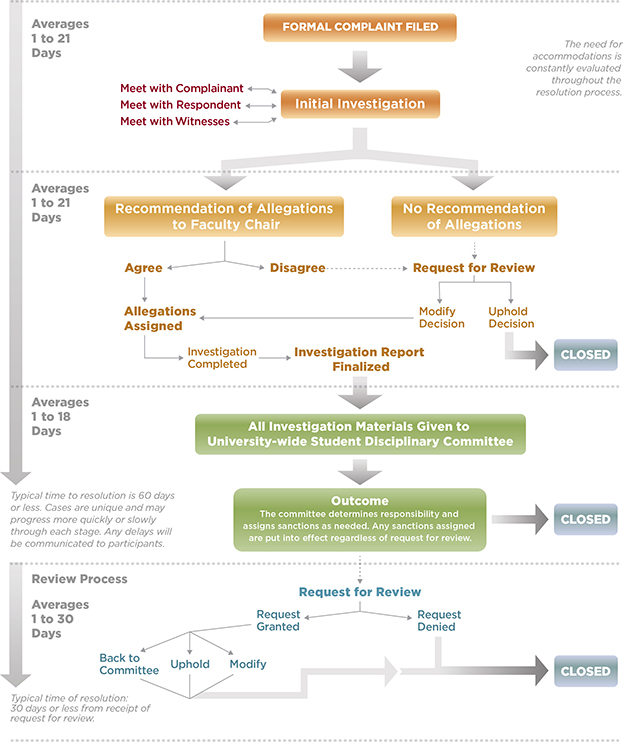 The formal resolution process is designed to give both the complainant and respondent the opportunity to present and respond to all available information related to a potential violation of the University Policy on Harassment, Discrimination, and Sexual Misconduct. The process is divided into four distinct areas, as outlined below. A printable version of the process diagram is also available here. During the formal resolution process, all meetings are private and the complainant and the respondent may bring a support person of their choice to any meeting during the process. The complainant and respondent will never be required to speak directly to one another during any part of the process. The formal resolution process is managed by the Associate Dean of Students in the University for Disciplinary Affairs.